Most of the historians agree that it is pretty sure the big battle of the year 9 AD (three Roman legions beaten by troops of Germanic tribes, which stopped the Roman expansion further to the North) had taken place in Kalkriese near Osnabrück. Ten years ago a museum was established very close to the battlefield. The famous mask of a Roman horseman of Kalkriese became the starting point of a school contest, some years ago: All schools in our area were asked to participate in the competition which consisted in making peace signs out of the old Roman field or combat signs, in other words transforming the war sign into a peace sign. Many schools and pupils (several thousands of boys and girls) took part and you can see the results in the museum park ... and in our school as well. After more than 25 years of a very hard war (the Thirty Years' War, 1618-1648) the powers in place agreed to start peace negociations, in the Catholic city of Münster and the Protestant city of Osnabrück (50 km from each other). The result was the first peace congress in history, the beginning of peace diplomacy. In 1648, several treaties were signed, one of the results was the independance of the Netherlands (from Spain), and as all countries represented in EuroPAXket were involved in that war and the peace treaties, we had the idea to show you our regional capital Osnabrück where the last treaty was signed, in October, 1648. 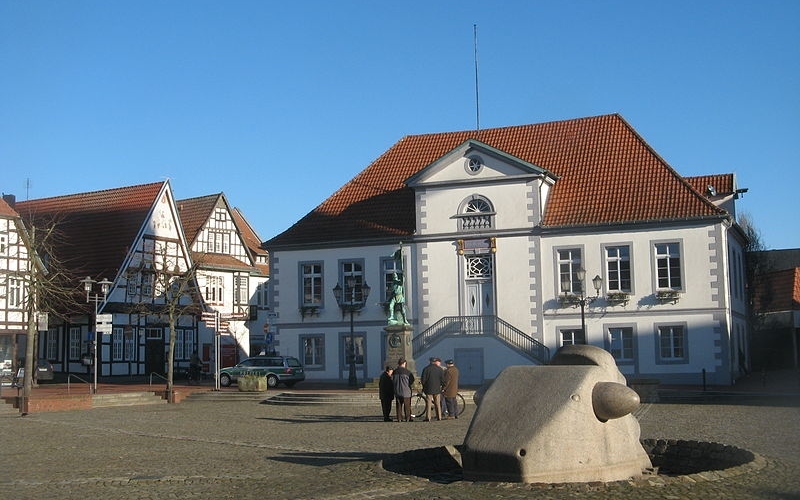 Nowadays, Osnabrück is thus considered the most famous peace city in Germany; there are congresses and meetings of all kinds related to peace activities.